Last Thursday, I was enjoying coffee on the patio of my home in Goodwood on the bright and beautiful morning of the Fourth of July when the large shadow crossed the ground in front of me. I looked up to see the shape of the largest bird of prey I’ve spotted in Goodwood since wildlife began returning a decade or so ago in larger and larger numbers. That includes not only hawks and owls, but several sightings of red and silver foxes and other wildlife in this increasingly urbanized residential neighborhood. I immediately identified the bird as an eagle — a young bald eagle — with a wingspan of perhaps three feet or more. I realized this was the first eagle I’d seen on any Independence Day, which simply made the day even more special. Like many, I have long been concerned about my nation, and I believe any and every American would recognize the symbolic gift of being visited by an eagle, even ever so briefly, on the Fourth of July. I watched as it flew to a tall oak and settled in the top branches, at least 80 feet up. I left my coffee to turn cold while I followed the bird with a 35mm film camera equipped with a long distance lens and high speed film. I stood on a street corner two doors away where I found my best view, and used all the frames already in the camera, then loaded another, taking about 30 photographs all told. The line of sight distance from camera lens to eagle was about 200 feet. At that early hour on that patriotic holiday, the streets were quietly deserted. But a few neighbors wandered up. Some were delighted to join me to see an eagle on the Fourth of July. Then came a young man, in his late teens, with no shirt, and no shoes, who came toward me from a block away. “Taking a picture of an eagle on the Fourth of July!” I said. “Cool!” he answered, stopping only briefly to view the bird. About 20 minutes later, the young man was back. “I just heard that eagle up there escaped from the zoo, man! They say it’s in the news.” I told him I had not heard about any lost birds from the zoo. Like most, I understand the work and dedication that goes into successfully caring for animals and wildlife. I’m grateful for talented folks who nurse wounded and injured animals back to health. But the bird I’d been watching and photographing seemed to be doing just fine on its own. If this eagle – or if any bird – had been able to fly away from human help, then wouldn’t that mean success? Shouldn’t everyone be pleased with that? Wouldn’t any creature prefer to take care of itself and live on its own without being dependent? My question to myself clearly described the battle now underway in America, with so many Americans sadly forced by circumstance to be dependent on government. Much worse is that so many are happily dependent by choice, surrendering their independence, unlikely to ever recover any self-sufficiency. Is a government that engineers, fosters and demands dependence not a government of tyranny? Repairing that grievous fault is exactly why a young America on the Fourth of July in 1776 declared no more dependence on a tyrannical king and went to war. This nation has celebrated that date of the year ever since, because living independently of government is better than living any other way! Perfectly clear to me. Otherwise, there would be nothing special at all about a bird in a tree on a Thursday morning. When the film in my camera was used up, I went back for another roll. When I returned, the eagle was gone. What I thought had been 30 minutes of snapping pictures turned out to be more than an hour and a half. The next day, with snapshots developed, something bothered me about the photos. They showed a bird with too much white below his neckline to be an eagle, something I had not noticed while taking the pictures. I began digging through bird books for pictures of eagles. The books showed eagles with various colorings as they mature. Still, I wondered. Had our visitor been an eagle or not? 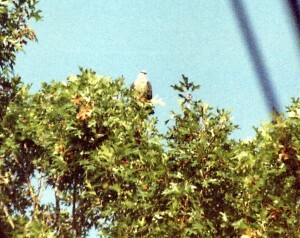 One neighbor with considerable expertise thought not.He immediately identified the bird as a Mississippi Kite. A what? A kite, not an eagle. How could he tell? Too much white on the bird’s underside. He showed me the bird right there in the book! From a distance, the kite could be mistaken for an eagle. But up close in the photos, it was no contest. My heart began to sink just a little, but, wait, not so fast! I searched my bookshelves for other photos I took of eagles years ago – one in particular I remembered. I’m no C.C. Lockwood with a camera, but I have fly-fished this nation from Vermont to Montana. I’ve seen and photographed a number of eagles in the wild. In my albums is my 1986 photo of a bald eagle on a tree branch alongside the Snake River in Wyoming, showing a head, neck, chest and tummy as white as snow. White from head to toe. Hmmm… I know now I was trying a little too hard to separate fact from feeling. It’s enough that I had an uplifting and encouraging reminder that my nation has a fighting chance. Independence Day of 2013 was the best Fourth of July I can ever remember. The friends I shared this story with that morning – the pre-kite version — said they also were delighted. I wonder now if I should apologize to them and express my embarrassment. I might keep that a secret for awhile, just between you and me. As for mistaking a kite for an eagle, all day long on that Fourth of July, the bird that crossed my path was an eagle, and nothing will ever change that!